A program to safely store your passwords and PINs. With only one password you get access to the crypted data (BLOWFISH 256 bit). This entries can be stored in folders and sub-folders. Cut/Copy/Paste of these entries is possible. 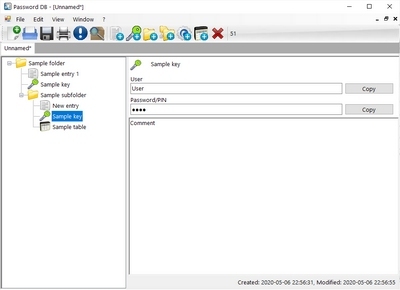 Password files can be converted to an executable file, which can be ported on USB-stick or other moveable drives without the need to install this program. You may also configure the program to lock itself after period of time (main password will be required again). So your data will still be safe while the program is running and you have to leave your PC. IMPORTANT NOTE: You are using this program at your own risk, please do not contact, if you lost your password! The program offers you a printing-option so you can also have a copy of them on paper. In addition you can also store your master password as a crpyted file on an external device (e.g. USB stick).